Lake Michigan’s Green Bay is developing dead zones similar to those found in Lake Erie and the Gulf of Mexico. In these zones, the oxygen content in the water is so low, virtually no fish, insects, or worms can survive. According to a report by the Associated Press, in a public webinar on Thursday scientists said the dead zone may cover as much as 40% of the Bay. Tracy Valenta, a water resources specialist for the Green Bay Metropolitan Sewerage District, said that the zone starts approximately eight miles northeast of the city and may extend more than 30 miles. By killing off invertebrates along the lake bottom, the lack of oxygen may have forced popular sport varieties such as perch and walleye to feed on less nutritious plankton higher in the water column. . . . It also may explain the disappearance of the burrowing mayfly, a species that scientists regard as a good water quality yardstick. The main cause of dead zones is phosphorus runoff, which often comes from farms, sewage, and fertilizer. According to the U.S. Environmental Protection Agency, the phosphorus acts as a nutrient which accelerates algae growth. That algae eventually dies and decomposes in a process that depletes large quantities of oxygen. The EPA has designated the Fox River, which flows into Green Bay, as an area of concern and has taken action towards reducing phosphorus. The Green Bay Metropolitan Sewerage District's website advises residents to clean up after pets and avoid over-fertilizing lawns to reduce runoff contaminants. 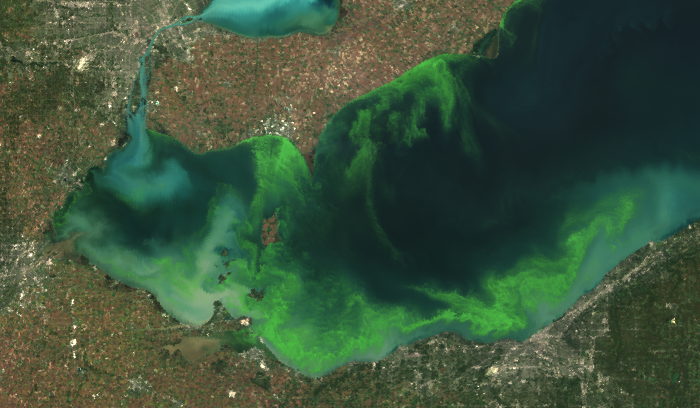 A significant amount of blue-green algae is expected in the western basin of Lake Erie this summer. This year’s algal bloom will be about 1/5 as bad as what happened in 2011. 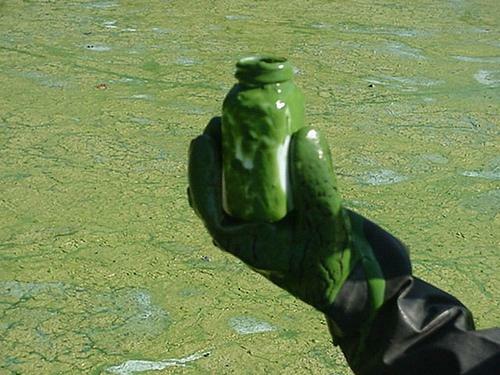 2011 was one of the worst years on record for the explosions of algae growth.